PROGRESS: Bunny Brown (middle) meets with Wagga Councillor Alan Brown in the main street of Tarcutta. 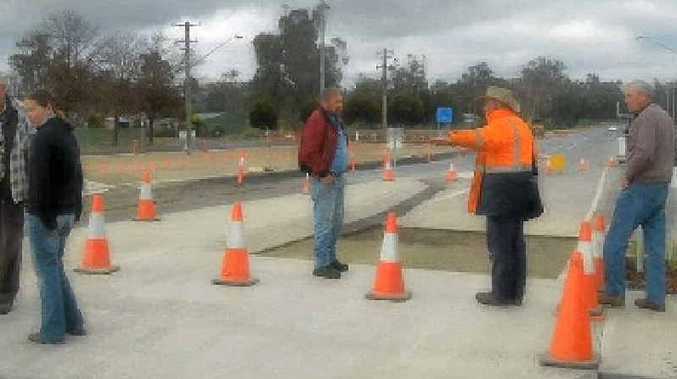 PRESIDENT of the Australian Long Distance Owner Driver's Association (ALDODA) Bunny Brown has said the Wagga Council would remove "ridiculous" speed bumps near roadhouses at Tarcutta. He said ALDODA was contacted last Friday by Darryl Weston from the Tarcutta Progress Association to have a look at the council roadworks in the main street of the town near the truckers' memorial. Mr Brown said council-installed speed bumps had caused five cases of trucks tearing their brake and fuel lines. "And it's the biggest changeover on the Hume," he told Big Rigs. As the major changeover for trucks travelling the Hume Hwy, the speed bumps became a major safety issue as drivers had started to boycott the town to avoid damage at least three weeks ago. Mr Brown also said roadhouses in Tarcutta were doing it tough as drivers' business was their livelihood. ALDODA and the Progress Association called an emergency meeting with the Wagga Council and the NSW Roads and Maritime Services last week. Mr Brown said the issue had now been resolved and the speed hump and cement was to be dealt with in the next week. "We urge the truckers not to give up on Tarcutta as the roadhouses and community needs them," he said. "We would like to thank RMS Steve Wardell regional Manager and staff for their prompt assistance."